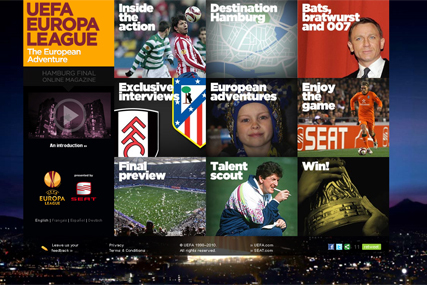 LONDON - Haymarket Network has produced an online magazine for tonight's UEFA Europa League final between Fulham and Atletico Madrid. The UEFA website carries branding for partner Seat and is available in four languages – English, German, French and Spanish. It offers an insider's guide to Hamburg, the final's host city, exclusive interviews with the rival managers, Roy Hodgson and Quique Sanchez Flores, and highlights of the semi-finals. The online magazine can work as a platform for regular updates throughout tournaments.